"Technology can be a means to access content on any topic, a tool for thinking and creating, a connection to peers and experts, and a window into other cultures"
This is an update to Bloom's Revised Taxonomy which attempts to account for the new behaviours and actions emerging as technology advances and becomes more ubiquitous. Bloom's Revised Taxonomy describes many traditional classroom practices, behaviours and actions, but does not account for the new processes and actions associated with Web 2.0 technologies, infowhelm (the exponential growth in information), increasing ubiquitous personal technologies or cloud computing. Bloom's Digital Taxonomy isn't about the tools or technologies rather it is about using these to facilitate learning. Outcomes on rubrics are measured by competence of use and most importantly the quality of the process or product. For example. Bookmarking a resource is of no value if the resource is inappropriate, invalid, out of date or inaccurate. Bloom's Digital Taxonomy lends itself to problem and project based learning where the student must work through the entire process of development and evaluation. The 21st Century Fluency Projects 6D model for Solution Fluency is an excellent example of how to work through the project or problem based learning frame work. This categorized and ordered thinking skills and objectives. His taxonomy follows the thinking process. You can not understand a concept if you do not first remember it, similarly you can not apply knowledge and concepts if you do not understand them. It is a continuum from Lower Order Thinking Skills (LOTS) to Higher Order Thinking Skills (HOTS). Bloom describe each category as a gerund. They are arranged below in increasing order, from lower order to higher order. This image was shared with permission from (http://www.schrockguide.net/bloomin-apps.html) under a Creative Commons Attribution-NonCommercial-NoDerivs 3.0 Unported License. The elements cover many classroom activities and objectives but they do not address the new objectives presented by the emergence and integration of Information and Communication Technologies in to the classroom and the lives of our students. This revision is fundamentally based on the revised taxonomy proposed by Anderson et al, but is more inclusive of digital technologies and digital cognitive objectives. 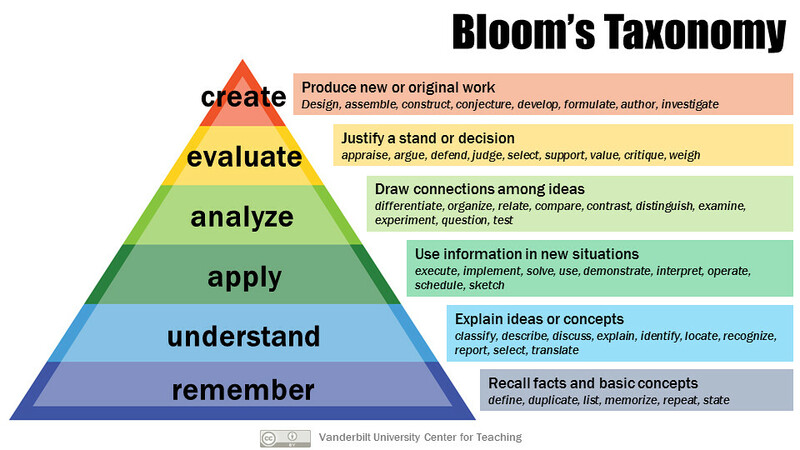 Bloom's as a learning process. Bloom's Taxonomy in its various forms represents the process of learning. It has been simplified in some case like the Three Story Intellect (Oliver Wendell Holmes and Art Costa), but it still essentially represents how we learn. Before we can create we must have remembered, understood, applied, analysed, and evaluated. Some people may argue about that you do not require some of the stages for each and every task, action or process; some too may argue about the necessity to reach the creation level for all activities. This is the choice of the individual. Is it important where you start? Must I start with remembering? I don't think it is. The learning can start at any point, but inherent in that learning is going to be the prior elements and stages.